Knottie1471286981, nourat, kmac407, knottie292bd25e134615df, craver827 and 42 others earned the Photogenic badge. Knottie1471286981, knottieef142fea41ab0e2d, knottie2483edffcf481f61, craver827, knottiefefcdf179e93e90f and 113 others were promoted to member. jilldoing, levyk101, kmsmith624, Ndesai423, Knottie15299450 and 2 others earned the Second Anniversary badge. ashleyd29, hollieraspberry, ershellb, angelabryan20, peaceandlove826 and 160 others joined. Hey all! I thought "Misc, #1 Must Have" was kind of similar to our monthly "Ask a STM" thread, since only STM could participate, so I thought we'd just roll it in to June's "Ask a STM" thread. This is actually our SECOND TO LAST "Product Spotlight"! Anyway, STM: if you could post your #1 Must Have for baby below, that would be brilliant. Put a link too, if you are so inclined. And of course, feel free to ask questions as well. FTM: Question away as per usual! I'll start us off because my DS is sick and it reminded me of using this product when he was a baby, lol. There are SO many "must haves," but this is one I never would have thought of and stumbled upon by accident the first time he was sick and I felt totally overwhelmed and unprepared. Rapor Raz Pacifier Clip, it retails for under $7 on Amazon. Since using vapor rub on a baby is a little EEK, this is actually just a pacifier clip that you insert tiny aromatherapy tabs into. It always cleared up DS and calmed him down during a cold without fail. He only used a pacifier to sleep, so other times we would just clip it to his clothes. Totally unexpected product, but definitely worth trying out. Those first colds are so nerve-wracking. Sleep nightgowns. They helped so much at night when I was sleep deprived and had to change diapers. Our swing was also very helpful! Swaddle blankets for dummies. Always my favorite baby shower gift. Amazon Prime. I think I ordered stuff on an almost daily basis those first few weeks. It was a lifesaver, especially with twins, to not have to worry about going out to get every little thing I forgot! I also really like the Halo SwaddleSacks and the SwaddlePods by SummerInfant. Boppy! I couldn’t have survived without it. If you have a two story house, get one for each floor. I loved our rock n play, so much so that I got one for my MILs house and I plan on having one on each floor this time as well! Boppy, and we did one per floor as @tarheelgirl8 mentioned. +1 to velcro swaddlers (though DD still got her arm out and MIL couldn't figure them out), and Amazon Prime. Though not immediately the "must have" the item from DD shower that has gotten the most use is the Exergen Temporal Thermometer one of my staff bought us. Makes those late night "why are you sobbing!? are you sick?" or general temp rechecks so much easier with a baby/toddler. The Miracle Blanket. It's a swaddle. Seriously, this thing was a game changer for us. 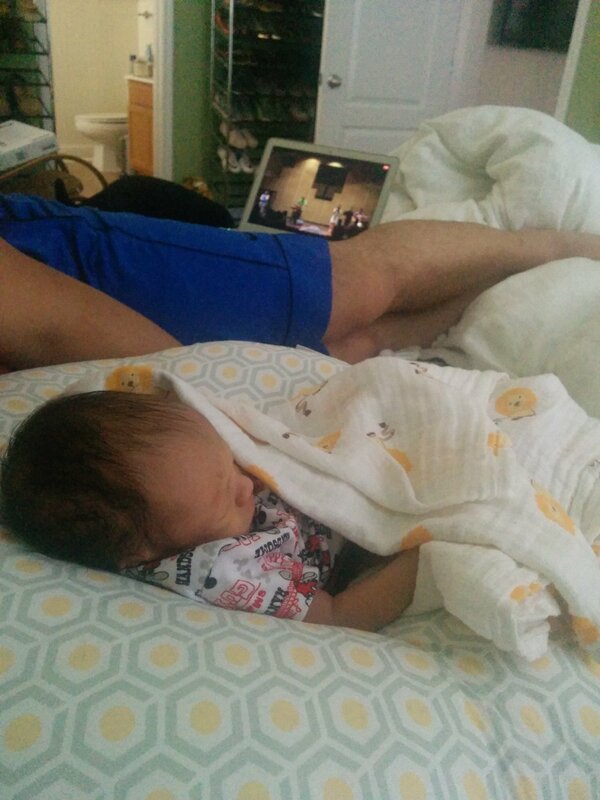 Got my 8 week old sleeping through the night, like he went from 2 hours of sleep at a time, to 4, to 6, to 8, to 9, within a matter of a few nights using it. +1 for the SwaddleMe velcro swaddles and then the Zippadee Zip starting around 3-4 months. Life savers for us! My stability ball also helped a lot during the witching hour weeks - sitting and bouncing her would soothe her more quickly than anything else. @cseley321 and @tarheelgirl8 did you use the boppy for anything besides nursing? @MrsMiller8588 I used our Boppy to prop up a baby for bottle feeds (I exclusively pumped)so I could either have a free hand to eat, or a free hand to feed the other twin lol. Baby Merlin's Magic Sleep Suit was life changing for us. I hope it works as well for this baby as it did for my first. @comealongponds that makes sense! Is it a safe place to set baby if you are doing other things? Like eating yourself or making coffee? Still trying to decide if I also need the lounger... I feel like i have so many places to put him already (mamaroo, bouncer, rock n play)! My boppy and swaddles just collected dust. They didn’t seem to be helpful at all but I have them available for this baby. Always funny what works for some and not others. Our must have was Gripe Water. I feel like we were constantly dealing with gas issues. I was always bicycling DS’ legs and doing toes to nose. Speaking of Gripe Water (which worked okay for us, but not great), the gas drops also helped us a lot - even if they didn't settle his tummy, the flavor/sweetness of it seemed to distract him enough to stop crying and be in less pain for a bit. And probiotics!! Seriously, he seemed to have some reflux issues and we tried probiotics instead of the more traditional medicines, and it made a world of difference. So just a comment from a FTM on swaddles. My LC just did a safe sleep training in order to start going over things in her class. One thing she said she learned is that you are no longer supposed to swaddle with blankets for sleeping - you are supposed to use the swaddles. Which makes me think of another question - how many swaddles should I have? Do I need to plan on having a new one every night in case or blowouts or spit up? @MrsMiller8588 that's odd, you mean rather than using a regular blanket, they only want you using ones made specifically for swaddling? Did she give a reason? I mean I am swaddling challenged and can only achieve a good swaddle with an actual swaddler for dummies (like the velcro ones or the miracle one I posted), but the hospital still uses regular blankets to swaddle. I have 3 velcro swaddles, 2 miracle blanket swaddles, and 2 halo sleepsack swaddles. I think you'd be totally fine with 2-3 total, IDK why we have so many honestly. I loved the halo swaddle sleep sacks, and the swaddle pods. We only have a few of the swaddle sacks I might splurge and get a couple more, or some swaddle pods in larger sizes, but wait to see if this LO likes them. @MrsMiller8588 as long as you keep an eye on them and don’t let them sleep in it, it’s fine! I would leave mine propped in it on the floor in the living room so they could see me while I made coffee/breakfast in the kitchen (open concept) and then move it up onto the couch next to me while I ate or whatever. We rotated between the oooh, swing, floor mat and vibrating rocker chair and they were happy! DD somehow slipped down into the HALO sleep sack a couple times and the velcro part was over her mouth/nose. I freaked out and never used it again. Probably our user error, but definitely be watchful if you're using it along with something like a Rock N Play where they are sleeping at an angle. @MrsMiller8588 - we had 3 or 4 swaddles and just rotated them. I did laundry almost every single day though. sound machine. we still use it for the kids. Isabella & Julian & and now #3! @MrsMiller8588 - we have very small kids (DD is 20 months, and only weighs about 20 lbs - 4 lbs more than the limit of the lounger), so we are able to use it longer than most other people. But in the newborn stage, it was more convenient for us than the swing, pack n play, etc. (of course we have all of the above bc well as first time parents we got EVERYTHING). But it was nice to have the baby in the lounger on the couch with me instead of necessarily in the swing. DH puts it next to him at his computer. Propping baby up on the bed. I feel like it just gave us more options around the house to have the baby than just the swing or pack n play. Here is DS hanging out on the bed with us one morning a couple years ago in the spoiler. They absorb so much and you can use the same one all day without it feeling super wet/crusty. When DS was little I had one in every room. I get these for every baby shower I attend. @flockofmoosen3 yes +1 to the sound machine! Still use it! @zande2016 she said not to swaddle with any blanket (even the "swaddle" ones) and to either use the velcro ones like above, the sleep stacks with zippers, or not to swaddle and just put baby in the crib in a sleeper. She didn't really say why (and I didn't really ask since I was planning to use velcro and sacks for ease of use). She did say the hospital still uses blankets and her opinion is they should stop because of the recommendations she heard, but that they are also better at swaddling and baby is more monitored during the hospital stay anyway. I already have 5 velcro swaddles and at least 2 halo sleep sacks (I think those are a little bigger). So I'm probably already overstocked. I'm so bad at laundry though..
Well funnily enough my doula was saying there are now some new studies about swaddling and whether or not it is necessary...she is going to send me some articles about it, and I will share once I get them! I have heard of studies saying that if you are nursing, you might want to give up the swaddles or not tuck the arms in because you might miss hunger cues such as the baby bringing the hand to mouth or rooting for the breast. I think it is is one of those preference things. If your baby sleeps better swaddled then go for it, if not then there is no need to swaddle. A battery And plug in powered swing was our must have. DD loved the swing, and I could unplug it and move it from room to room or plug it in for the main room and not eat through batteries. We did end up getting rechargable batteries anyways, also hugely recommended even though it's more upfront cost. Saved us a ton in the long run. Sheet savers-- I used them for on the go diaper changes and not actually in the crib or bassinet. They are soft, absorbent and have a waterproof layer. Also those Gerber cloth diapers are excellent burp and all purpose cloths. The regular Gerber burp cloths are okay, but the diaper ones are best. This. I don’t even have one for this time around. I am a big supporter of holding/wearing baby as much as possible so in general I’m not a huge fan of places to put them or set them. We do have a rock and play and a swing, in addition to the crib though. I also second the gowns for quick diapers changes, and the easy swaddle blankets. Those can be a life saver! +1 to cloth diaper burp cloths! Those are the best!! I made a bunch for LO that have little flannel patches across the middle. I think its interesting that the advice is to not use swaddle blankets. I’m definitely not using swaddle thingies with the Velcro. I’m confident in my blanket swaddling abilities and don’t want to have to buy a million thingies with Velcro on them in different sizes just for sleeping. Blankets are a lot more versatile I think. But definitely follow your doctor/midwife’s recommendation. I also didnt love love the sleep gowns. Babies are floppy and I thought it was harder to get their little bums out of the gown than it was to just unbutton or zipper quick. I have some left over from DS though so I plan to give them another try because apparently I’m the only one that hated them lol. I also love my bobby! And my rock n play! Two life savers for sure! @MrsMiller8588 do you have a regular boppy? I always propped my kids up on those. It’s not something I’d leave them unattended in but if you already have the original boppy then you could just use that to prop and return the lounger. @ashbub714 I think a lot of people use them to sleep in, just like a lot of people let baby sleep in a swing, but you just have to be aware that technically its not approved for that purpose unattended. I think the issue is anything that can leave the baby chin to chest for an extended period of time and cut off the airways, right? DS slept in a swing often, sometimes even at night when the reflux was bad and we got desperate. @MrsMiller8588 I used it mostly for nursing but I’ve heard that it’s also great for bottle feeding. The extra support was great....You’d be surprised at how heavy an 8lb baby can feel after holding them for an extended period of time. DD also tended to fall asleep right after nursing and so often I would just stay sitting and let her nap on the boppy in my lap.